I can’t believe that I have never written about this hot buton issue, but twenty years on and I have yet to discuss a touchy subject for many: Disabled parking! In the 62nd episode of Seinfeld, the comedy made fun of George and Kramer for parking in a handicap space, causing a disabled person to suffer a hospitalization as she tried to find appropriate parking. The crowd ends up demolishing the prized car of George’s father as retaliation for the transgression. And face it, sometimes it is human nature to want to exact some revenge for what we perceive as a slight against a disabled person who needs a parking space. WhIle I long ago gave up wondering “if that person” really needs a disabled space, I know lots of folks still get a head of steam built up over it. It is on the more popular memes on Facebook to this day. 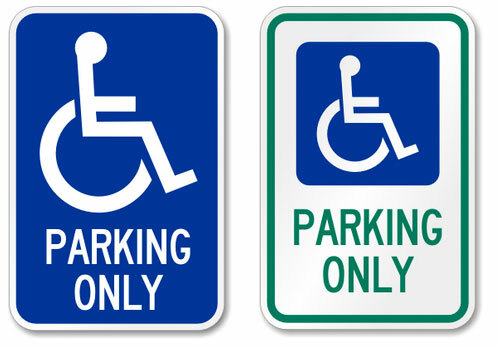 Who is eligible for a permanent or temporary disabled parking permit? Essentially anyone who can get a “licensed doctor of medicine, osteopathic medicine, podiatric medicine, optometrist, or chiropractor” to sign an affidavit “stating person is a disabled person, the specific disability that limits or impairs the person’s ability to walk, and that he or she is a person with disabilities as specified in paragraph (5) of Code Section 40-6-221”. (OCGA 40-2-74.1). Your preacher can’t do it for you, your lawyer can’t do it for you, but one of those doctor’s can do it. Then you go down to the tag office and get the permit, no fees charged. A permanent permit is good for four years, a temporary for 180 days. The rules about the proper marking of the parking space are far more strict. OCGA 40-6-221 (3)(A) includes: space must be marked by “a blue metal reflective sign which is at least 12 inches in width and 18 inches in length and is erected at a height of seven feet from the bottom of the sign to its ground surface and in such manner that it will not be obscured by a vehicle parked in the space and bearing the following words: “Permit Parking Only,” “Tow-Away Zone,” and the international symbol for accessibility. The warnings required in this subparagraph shall be centered on the sign, printed in white, and shall occupy not less than 75 percent of the surface area of the sign. The sign required by this subparagraph shall be the official authorized sign for parking place designations for persons with disabilities in this state.” Now that’s a mouthful. But on private propety, anything close to a warning will suffice until the sign is updated or modernized, says Par. (3)(B). (G) Is a blind individual whose central visual acuity does not exceed 20/200 in the better eye with correcting lenses or whose visual acuity, if better than 20/200, is accompanied by a limit to the field of vision in the better eye to such a degree that its widest diameter subtends an angle of no greater than 20 degrees. There are a myriad of other special parking permits, but this covers the 90% solution. Next week, the penalties for parking in disabled parking spaces.